The story is fiction. There is no Mike Knight and there is no Altus Labs. But the details in their story are taken from my experiences implementing the Critical Chain in companies all over the world. Be Fast or Be Gone shows you how these simple principles are applied on an individual project and throughout an organization. It shows you what happens when the principles aren’t in place, and it shows you how fast change can happen when they are. It shows you how you can leverage Critical Chain in your efforts to continuously get better and more competitive. It shows you the way to become a market leader. 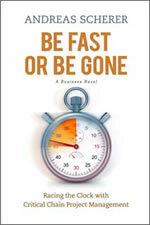 Be Fast or Be Gone is a fascinating treatment of the power of focus, applied to the often complex world of project and strategy management. The answers to increased productivity, though simple, are often subtle and hidden beneath old and accepted practices, requiring an incisive and radically rational viewpoint. Scherer's book (and the ProChain process it reflects) beautifully illumines such a process. Andreas Scherer provides a highly engaging explanation of Critical Chain and describes its application to development projects. Every R&D director should read this book and every project manager should become a Critical Chain expert. Be Fast or Be Gone will open your eyes to the possibilities of realistic schedules and on-time project completion. Using the principles espoused in Andreas Scherer’s book Be Fast or Be Gone, pharmaceutical companies can substantially shorten their research and development timelines, allowing drugs to be available to patients much more quickly. I found this heartfelt tale to be a grabber. What a powerful way to illuminate that racing the clock is of vital import, not only to a company’s leadership posture, but ultimately to the huge impact it can have on customers’ and patients’ well-being! Be Fast or Be Gone puts "meaning" into accelerating projects. Better yet, it puts METHOD into achieving Dramatic, Reliable Improvements in Speed and content Quality for any project management environment. A gripping , understandable, helpful novel for every person wanting to get things done! Riveting. Finally, a book that shows us in a practical and engaging way the real impact project management and Critical Chain concepts can have. This story of a father's quest to save his little boy is extremely real; you will easily identify with the book’s characters. A must read. — Eric Morfin, Ph.D., PMP; Founder, BioPharmaPM; Partner, Critical Skills Inc.